Does Owning a Welder/Generator/Air Compressor Make Sense for Residential Contractors? Residential construction is not the first industry you think of as it relates to welding equipment. There’s very little in the way of traditional welding that takes place in typical single- or multi-family units — some brackets here, a beam or two there, possibly some HVAC components. Certainly nothing requiring high deposition rates or advanced productivity measurements. The advent of home design, flipping and DIY restoration shows, however, has awakened an interest for non-traditional elements in many new construction developments. This includes structural steel embellishments, or more decorative flourishes such as aluminum and stainless steel. The continued evolution of engine-driven welding technology that has allowed industrial multi-functionality to be incorporated into a single “box,” while also coming in a more manageable footprint at lower costs, should have some contractors rethinking how they do everything on site from powering lights and air tools to incorporating more steel and decorative metals into their builds. The primary value proposition for a combination welder/generator/air compressor on residential sites is also its primary negative factor. Contractors can eliminate multiple standalone units and accessories in favor of a single, engine-driven unit to operate and maintain. This is a positive in that the standalone generators and air compressors — each with their own engines and fuel tanks — can be combined into a single unit on site. This leaves only one engine and machine to maintain, fuel, transport and move around. It also presents the biggest possible complaint: If that one engine fails, all the functionality goes away until it’s fixed. As welding manufacturers such as Miller Electric Mfg. 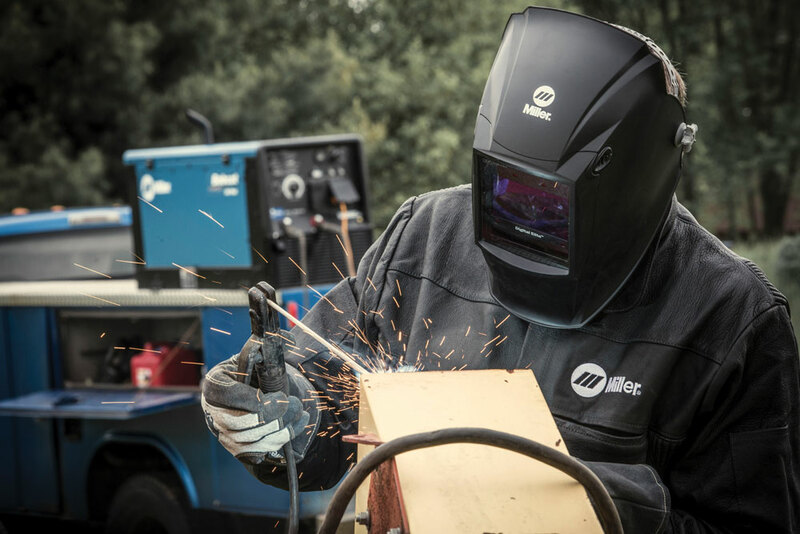 LLC and Lincoln Electric have evolved engine-driven welding technology, these fears are tempered by the industrial durability of the equipment and the world-class engines built into these machines from trusted manufacturers like Kohler and Honda. Industrial grade products designed with industrial grade engines result in longer life and higher reliability. Brian Dieck, director of sales and marketing for the Power Systems Division at Miller, touts the added benefits of sound reduction and more intelligent engine speeds made possible by the more advanced, yet simple to run, combination units. Another big advantage of a combination unit is the ability, in theory, to reduce fuel use over the lifetime of the unit when compared to individual standalone units. More basic standalone equipment typically either runs in the “off” position or at full throttle. More industrial style combination units feature an engine management setting/control that ensures higher engine rpms are only engaged when a load is applied, versus running wide open all the time. This also ensures that the engine is running as quietly as it can when not welding or powering tools. “It should always back down to idle speed whenever not providing output power, to conserve fuel and minimize noise output,” says Dieck. Concerns may be raised that a combination unit could be undersized (in output) for some applications when compared to standalone units, but this concern can be alleviated. Concerns may be raised that a combination unit could be undersized (in output) for some applications when compared to standalone units, but this concern can be alleviated during the selection process by understanding the output demands of air and power tools on site and selecting a solution based on that. The same consideration needs to be established for air power. Among the most-used items in residential construction are framing/nail guns and tools like impact wrenches and air drills that also require compressor power. Each requires a certain cfm (cubic feet per minute) to operate individually, as well as a certain psi (pounds per square inch). The demand can range from 2 to 10 cfm for many of the common tools used in residential construction — but the cfm rating needs to be combined if numerous tools are regularly used. For instance, if there are three framing guns running at 3 cfm each, the actual demand is 9 cfm (and likely a bit higher to ensure consistent production). The psi demands of each tool are not similarly compounded, but contractors need to be aware of the psi requirements of each tool and make sure the compressor they choose exceeds those requirements. Many of the combination welder/generator/air compressor units exceed these demands. The Bobcat 200 Air Pak, for instance, provides 28 cfm at 175 psi at 100 percent duty cycle. If air demand exceeds even that, the system can be complemented with an external air reservoir to meet demand. As it relates to welding, it all comes down to a matter of process. These combination units will generally deliver more than enough welding output than the typical residential contractor would ever need. While the majority of these units are designed for Stick welding, some have enough power to run smaller/portable units that can also perform MIG and TIG welding for working with decorative steels like aluminum and stainless. Constant Current (CC) units can also be outfitted with accessories that make TIG welding possible from the engine-driven combination unit — contractors should discuss options with their welding equipment dealer. Some of the combination units available today also come with battery charging/jump starting capabilities, which can be helpful on construction sites in cold weather or to start that old truck or skid steer that just needs that extra boost in the morning. 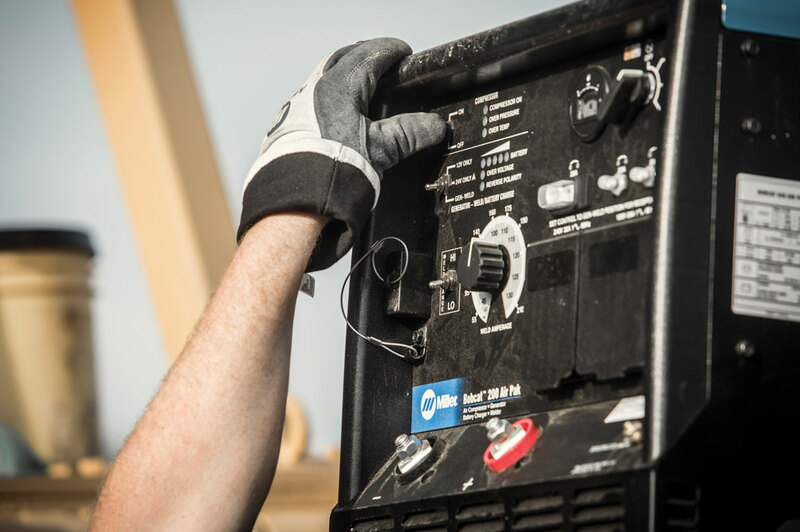 Having a combination unit with welding capability on-hand can also help curtail downtime that may occur with equipment failure, such as damage to buckets or other attachments. More significant structural welding on a piece of construction equipment should be left to trained professionals. These solutions can also speak to the can-do, get-it-done nature of most residential contractors who are always looking for a way to get a leg up on the next project or to further streamline how they do their job. Bill Elverman is a freelance writer for Compact Equipment. Lincoln Electric is dedicated to developing a cadre of qualified welding instructors who will usher in the next generation of highly skilled welders. Lincoln Electric recently announced its newest education initiative — the Lincoln Electric Education Partner Schools (LEEPS) program. This multi-tiered program supports welding instructors at every level — from junior high school to technical college and beyond. At each level, participating instructors may obtain Lincoln Electric qualifications and other benefits by meeting specific program requirements. In addition, schools that meet key requirements may become Authorized Training Facilities, authorizing the school to run Lincoln Electric seminars. LEEPS keeps instructors current and relevant within the welding industry by integrating a professional development system into the program. 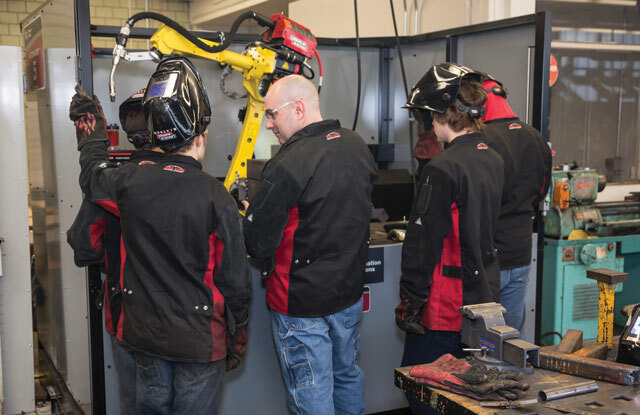 This provides value to both instructors and administrators at participating schools.” For more information, visit lincolnelectric.com. Read more about welding here. A Kohler powered unit can be an asset in decorative and structural steel work. I am not sure id these units are appropriate for aluminum. This type of ubit would be good for an equipment service unit, repairing compact equipment in the field.